PE Explorer: What's New in The Current Version. Resource Editor, UPX Unpacker plug-in, Data Directories Viewer. Your program is great, and I hope you continue to develop it. Among the programming tools, PE Explorer is a jewel for me. In spite of its small size, no related application, indeed, could reach its overwhelming features. Moreover, its smart interface increases the pleasure to use it. One of the reasons that I bought PE Explorer was the Disassembler. Good stuff. The other reason is the GUI - it is really useful when trying to get an overview over a given PE file. Version 1.99 R6 provides the option to mark blocks as Byte, Word, DWORD, QWORD and GUID in the Disassembler. There're also new options to create the Windows 7 Compatibility and DPI-Aware sections in the Manifest Wizard. Version 1.99 R5 provides the option to view or set flag bits in the PE file header Characteristics field. There's also a new option to specify the processor architecture in the Manifest Wizard. Version 1.99 introduces the Digital Signature Viewer. This lets you view the certificate-based digital signature of a executable file, validate the identity of the software publisher, and verify that the signature is valid and has been applied properly.  Now supports viewing and replacing large (256x256) PNG compressed Vista icons. 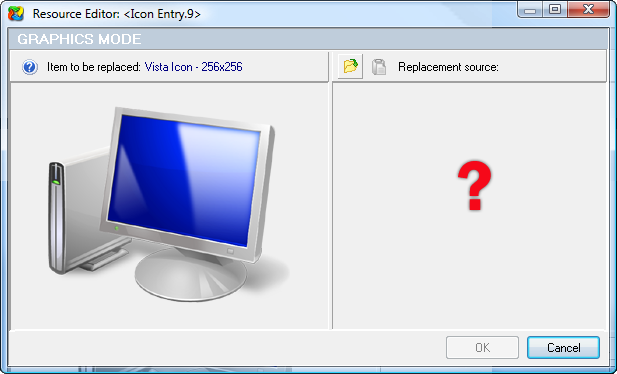 The standard Microsoft Windows Vista® icons now include 3 additional formats: 256x256-4bit, 256x256-8bit, and 256x256-32bit. They are PNG compressed and ignored (but not rejected) by Windows XP. Uncompressed versions of the icons will work on both Windows, the PNG compression is used to reduce the icon size and embedded in the ICO file for the 256x256 images only.  Bugfix: Fixed an error that occasionally occurred when searching for an offset to fields in the VCL objects. We are always looking for ways to make PE Explorer more useful to you, so please let us know what you think.